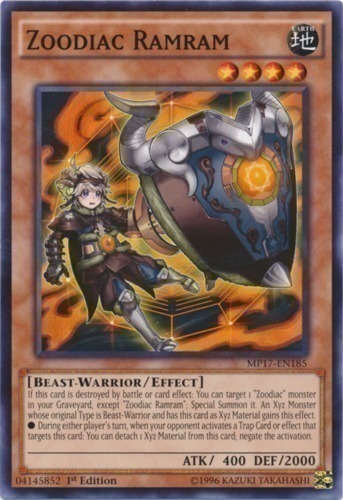 Text If this card is destroyed by battle or card effect: You can target 1 "Zoodiac" monster in your GY, except "Zoodiac Ramram"; Special Summon it. An Xyz Monster whose original Type is Beast-Warrior and has this card as material gains this effect. ● When your opponent activates a Trap Card or effect that targets this card (Quick Effect): You can detach 1 material from this card; negate the activation.